Happy Halloween! 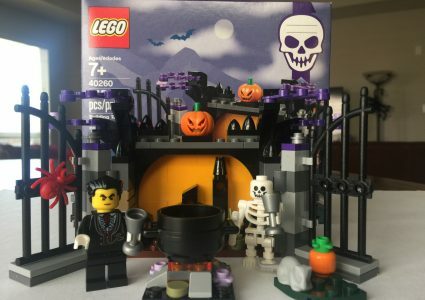 Today I thought would be perfect to look at the Halloween Haunt, this year’s Halloween set from LEGO®. 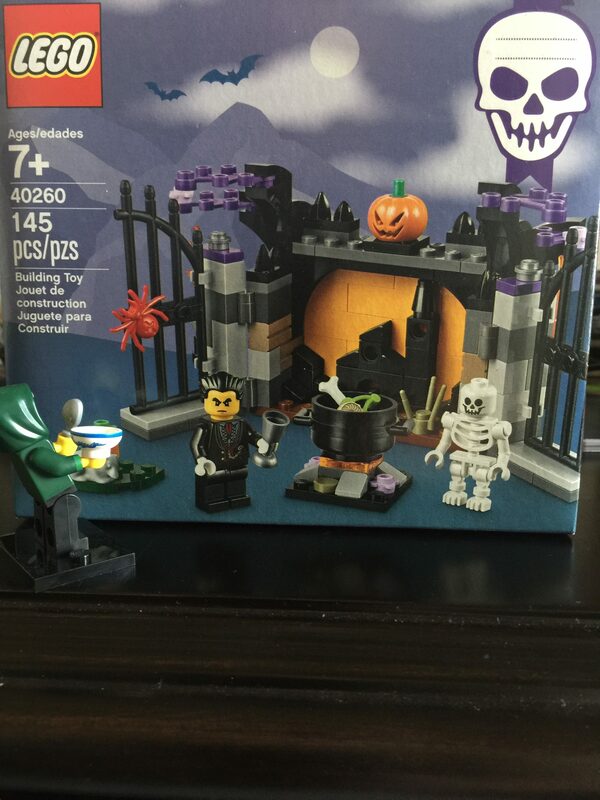 LEGO® switched to putting out a couple of polybags for Halloween, and moved to a larger boxed set. This has ranged from small vignettes to brick-built figures. I’ve been a fan of the vignettes, but not so much of the figures. 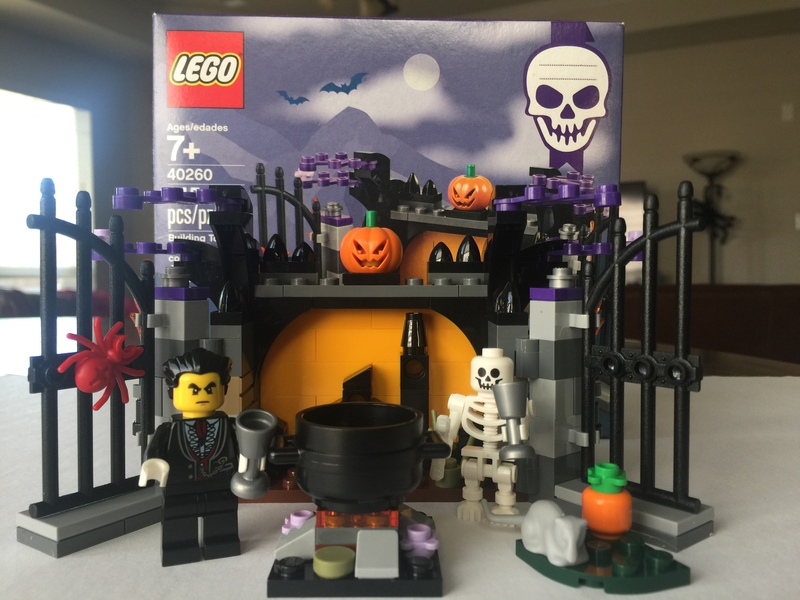 This year LEGO® returned to a vignette, and we get a nice set that captures the spirit of Halloween well! 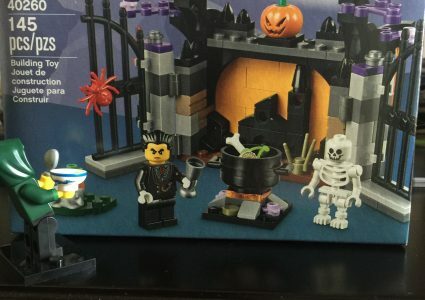 To start off, we get two minifigures, a vampire and a skeleton. The skeleton is nothing new or unique, and has shown up quite a bit in past sets. I’ve always been a fan of the skeletons, so it is nice to add another one to my collection. The vampire is well dressed, including a pocket watch, which I’m sure he checks regularly to avoid the sunrise. His torso is printed on the front and back. He is wearing white gloves. I’m sure this is so he does not tarnish his silver, but also so he does not get whatever he is brewing on his hands! He has a very serious look about him, not a character you would want to meet in a dark alley! This is a fun change from vampires with their fangs and capes, so well done LEGO®! The scene is set in front some large black gates that open up to a path to the vampire’s spooky castle. The vampire has a cauldron sitting atop a small fire. Crawling on the gate is a large spider. Scurrying across the floor to chomp on a pumpkin is a rat! The pumpkin can also double as a head, so if you’re looking to make your own version of Pumpkin Head in LEGO®, now is your chance! As far as pieces go, nothing too spectacular to mention for the most part. You get some pieces molded to look like bricks, a few arches, the gates. There are also purple leaves included. I think my favorite piece has to be the large pumpkin that is carved into a jack-o-lantern that sits on top of the gate. The piece is hollow, and you could fashion up a light brick to illuminate the jack-o-lantern. This is not a new piece, it has appeared in other sets, most notably the Disney Castle. Overall this is a fun set, and could be brought out each year to help decorate your home for Halloween. And for the price, you do get a fun minifigure and the large pumpkin!